Considered by many to be the industry's easiest to operate ratchet lever hoist, the Coffing LSB-B series is rugged and lightweight. Made with an impact-resistant stamped steel housing that withstands rigorous use and a compact design that makes them easy to tote and transport. Double reduction gearing and short handle with a cushioned grip provide easy operation with minimal effort. 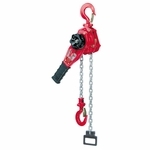 A 360º rotating handle provides versatile rigging options when used in confined spaces. A state-of-the-art free wheeling mechanism allows quick and easy one-handed take up and positioning of the slack chain. An enclosed screw-and-disc type load brake stays clean and dry for positive load positioning, and latches on hooks provide positive load engagement. An	optional load limiter alerts operator of a possible overload by allowing the handle to rotate to avoid lifting above the hoist's capacity (load limiter can be installed in the field). Backed with a	lifetime warranty for your peace of mind.